This weekend I went on a last minute overnight trip to Branson, Missouri with my Sweet Man. He had a gig and needed a travel buddy, so I was happy to volunteer of course. One of the best parts was that we got to stay in a great hotel right downtown where I could walk to all the shops – old & new – while he did his music thing (it was for a insurance convention, not exactly exciting stuff for me.) So all of Saturday evening I got to shop and browse kid & agenda free all I wanted. No one was waiting on me to get home, no one had opinions about which shops we should or should not go in, there were no banners waiting for me to string in my hotel room. Just me and my camera and a few spending dollars exploring Old Branson. …My favorite stop? By far Dicks 5 & 10. Why did we ever let go of this store concept? the best shopping baskets ever… I remember Hancock Fabrics having these when I was a kid. Who knew hair nets came in so many shapes & sizes? 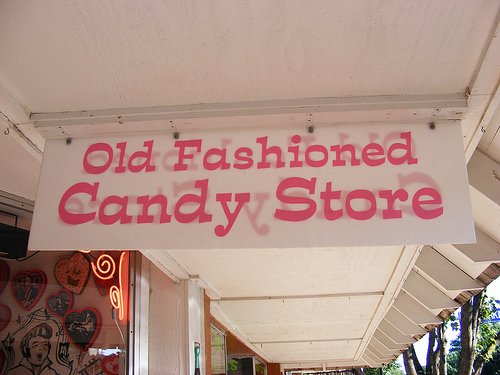 In addition to the 5 & 10 there were several old fashioned candy shops – always great for picture taking…. I think this is going to be my new fee structure.OK, mini-break over. Now it is back to work & kids & house & my lovely little everyday life! I love Branson! The baskets were way too cute. Glad you got a much needed break. Hey, I've been there! You were definitely in the best store in Branson. Wow-I was instantly transported back in time when I saw your picture of those fold-away baskets! We still have a 5 & 10 store in our town-you can always find anything there. I only wished they carried even more vintage items! Sounds like a wonderful weekend of “me” time for you – much deserved & you'll be refreshed once you're home. Also, had to comment & tell you how beautiful the circus pieces were! Just gorgeous! We live about 40 minutes from Branson and I've never been. Guess I'll have to change that. Great pictures. Oh, the hairnets!!! My grandmother never drove and when I visited she'd beg me to take her to Woolworth's so that she could buy her hairnets! And I love those housecoat frocks. All the ladies had one that protected their clothing as they worked around the house. Thanks for the memories. Love those pics. You found the best store in Branson, why am I not surprised?